Alright, stop! 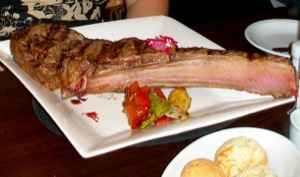 I assume that you, like many travelers to Buenos Aires, are in search of the best steak of your life. I found it. However, I cannot say that I found it on my own. Every article you read or person you talk to will tell you that Cabaña Las Lilas in Puerto Madero is the home of the best steaks in Argentina, and some will argue that they make the best steaks in the world. After my experience, I could not argue against these claims. Pricier than most restaurants, Cabaña Las Lilas begins with an appetizer sampler and extensive bread selection that are both included in a mandatory 15 peso cover charge (“cubierto” in Spanish). After that, appetizers (ranging from around 20-35 pesos) and wine (45 pesos and up to over 1000) can be ordered; including my selection of an amazing carpaccio dish with a small arugula salad and shaved fresh Parmesan cheese as well as a lower priced, but still very enjoyable, Mendozan Malbec. One could happily enjoy these starters and then ask for the check, but come on, you and I both know that you came to Cabaña Las Lilas for steak! While there are other options for entrees, no one in my party of six people had the nerve to order anything but a big, juicy piece of masterfully grilled red meat. Main courses range from about 45 pesos to slightly over 60 pesos, but are worth every penny (or should I say centavo). I went with the “lomo” (filet mignon) and asked that it be prepared “a punto,” which literally translated to “on point,” but means medium/medium-rare. When I received my lomo a few pieces of hot bread and a glass of Malbec later, I saw two huge pieces of filet that must have been 3 inches thick and each weighing fore than 8 ounces. But “so what” you say. “Just because a place charges a lot of money for their steaks and gives you big portions does not mean that it is the best steakhouse in the world!” True. However, I began to feel that this would be the best steak I had ever eaten when it took me less than three strokes of the knife to cut through the three-inch tall piece of meat, revealing a perfectly pink center oozing with flavorful juices. I think the ensuing 15-20 minutes that followed have been blocked from my memory because it would be hard for me to enjoy anything in life if I had that span of time to compare it to. Let me just say that Las Lilas is a must for anyone who gets pleasure from a nice piece of steak. After I snapped back to reality and my eyes rolled back into place, I noticed similar looks of glee around my table. From a bife de chorizo to the Cabaña Las Lilas special that was literally more than a foot long, everyone was more than satisfied. And once our empty plates were tearfully taken away, we took a look at the dessert menu. Unable to eat much more, we still gorged ourselves with a selection of desserts, ranging from a homemade chocolate masterpiece to a panqueque (Argentine version of a crepe) overflowing with some combination of sugar-infused filling to some sort of apple crumble-esque slice of wonderfulness. (Yes I am aware that I just made up a few terms in that last sentence, but I was still in a beautiful food coma.) After a few coffees to give us the energy to push our chairs back and stand up and walk out of the restaurant, we paid the large, but by no means excessive check, and headed out the back exit to end our night strolling along the beautifully lit port of Puerto Madero. This page rendered in 0.469 seconds.